This bright blue flower only lasts a day but there are a whole host of them inside the boat shaped bract, each waiting for their day of fame. Commelina dianthifolia is hardy here as long as we keep the small tuberous roots dry over the winter. It comes from Mexico. 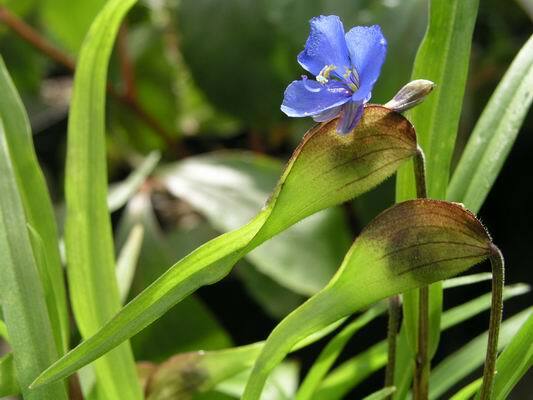 While quite different in colour to Commelina, The South African Lapeirousia or Anomatheca laxa as it is now called, has a similar requirement in cultivation. We have had it growing in a dry bed for many years now. The corms usually get killed off in the winter but as it seeds itself around and reaches flowering size in the first year we are never without a few clumps of its brilliant scarlet flowers. 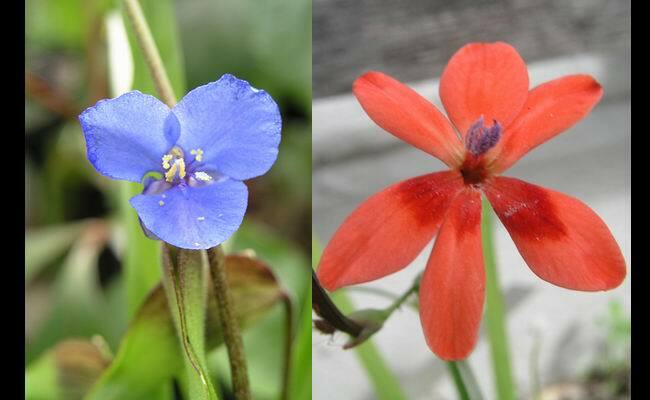 I must spread some of the Commelina seed into the same bed to see if we can get it established outside as well. Another brilliant blue flower, this time from the Himalaya, is Parochetus communis. 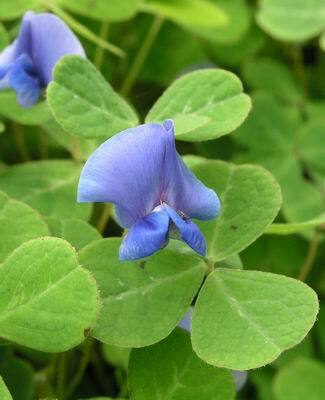 From the leaves you could be forgiven for thinking it is a clover but the pea-like flower sets it apart. It could become a pest if we let it romp through the humus rich beds, but we keep it confined to the sides of a path and pull up any stolons that get into the beds. 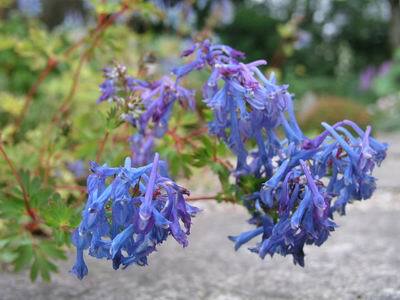 Another regular on the bulb log is Corydalis x 'Craigton Blue' our own cross between C. elata and C. flexuosa. I feature it again to highlight how long a flowering period the deep blue honey scented flowers have. It is still seed time in the frit house when we can enjoy the beauty in the form of the various seed capsules. Fritillaria stenanthera has large dark seeds that spill from the pointed capsules. This Fritillaria severtzovii capsule illustrates well the structure and shows how the seeds ripen from the top. 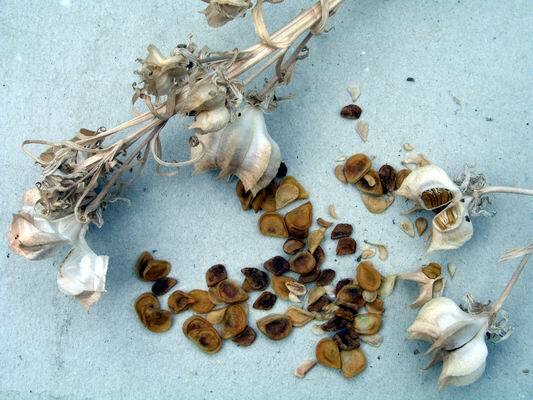 When Fritillaria seed is ripe it is usually a brown colour but do not worry if some of the seed you collect is pale as it will turn colour after a few days in the air. 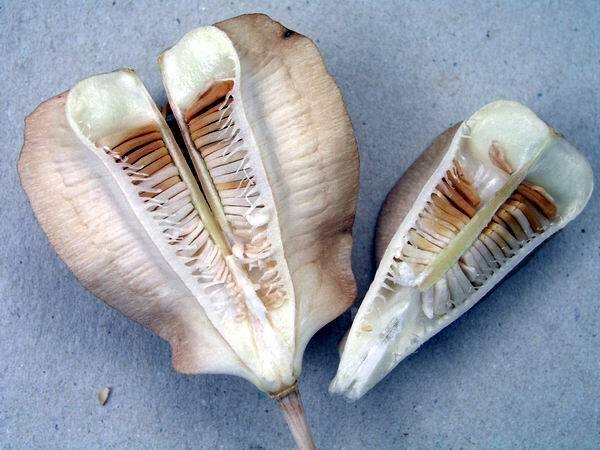 It is easy to see the viable seed as you can see an embryo in the centre of the papery seed. 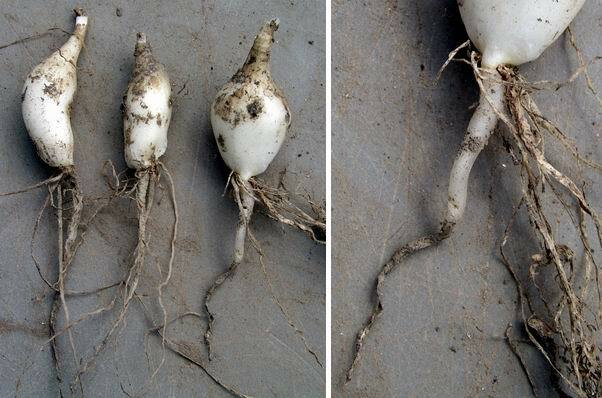 Even though I sowed these Narcissus seeds 10cms deep, these 3 year old bulbs, being re-potted for the first time, have a contractile root which has formed to pull the bulbs even deeper down. You can see the remains of the normal root system have dried out already and as the contractile root dries out, it shrinks in length, pulling the bulb down. 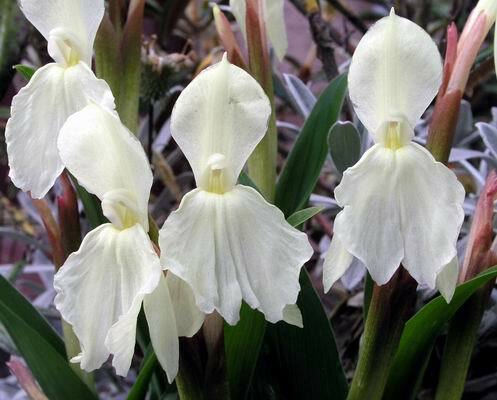 The bulbs also have an elongated shape another sign that you need to plant them deeper. 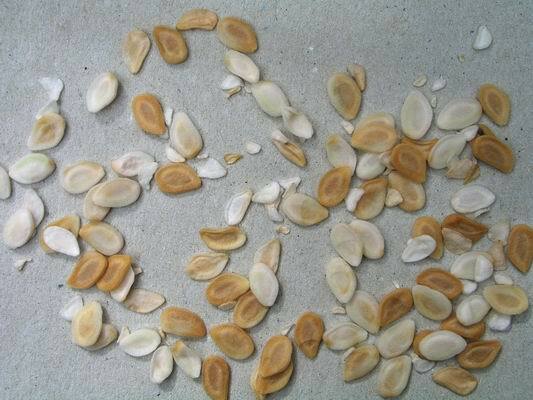 In last weeks log I showed you some rotting Fritillaria scales which I placed into a bag of dry sand. Here is one I did earlier and it illustrates nicely that all is not lost as these rotten scales have produced a nice lot of small healthy bulbils. I do not remove them from the old scale too soon, unless I think there is a danger of rot transferring to the healthy young bulbs, as they will continue to draw from the food reserve stored in the scale - just keep them in dry sand. 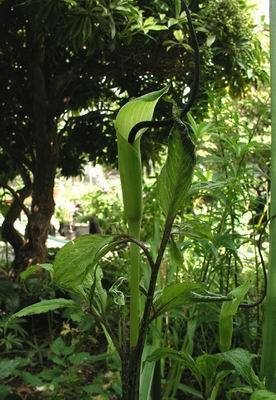 A seed raised Arisaema which I think is A. tortuosum. 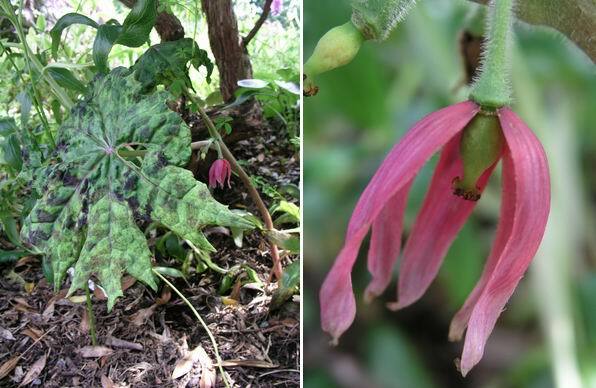 I am not up on the naming of these wonderful plants and I am always delighted when you let me know the correct names. The same can be said of Podophyllum. Not knowing the name should never stop you growing a plant - it is for the beauty of the flowers and leaves. Last picture for this week is Roscoea 'Kew Beauty' which is said to be a hybrid between R. humeana and cautleyoides and it certainly looks intermediate between these two.